Here’s one more car we found at Cars and Coffee today: a 1986 Ford Mustang SVO. This one hit home since we are an original Mustang SVO owner and attended the classic 24 hour endurance races at Nelson Ledges where Ford engineers went up against the best of GM and Porsche . The link contains our personal account of our attendance at that event, where we spent two years as workers helping put on the event, posted right at the SVO pits. We were in the middle of all the action, met the Ford engineers, saw the middle of the night engine swap, the damage when Porsche decided to run the Mustang off the track, and much more. For us, this resulted in our buying an SVO as soon as they were avaialble, and soon thereafter we made our own debut on the track. That track was Watkins Glen, the most awesome track in the country. This was a very nice example, with a well preserved cloth interior. 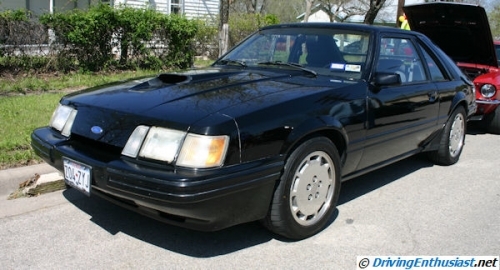 We’re on the market for a clean example of one of these (85.5 or 86), and of course it has to be black. We noticed that the aftermarket is making a few original SVO parts, including new foam for the seats as well as original cloth and leather covers. That’s good, since the originals had very soft foam that didn’t last long. The next question is what to do with it when we do get it. For example, do we move to a late-model braking system with multi-pistons calipers, and perhaps even retro-fit an SN95 anti-lock braking system along with an IRS? That’d be ideal… but a 200-205 HP 3000 pound car doesn’t cut it these days for track events. Nope, this is a car we’d have to love for what it is. We’d restore it and keep it stock.